SEO is the acronym for “search engine optimization.” The boring definition is that it is “the process of getting traffic from the ‘free,’ ‘organic,’ ‘editorial,’ or ‘natural search’ results on search engines.” It’s a system to increase the number of visitors to your website based on your search engine rankings, which is important. Because let’s be honest, when is the last time you actually used Page 2 of Google Search Results? (Thought so.) It’s an alternative to paid search ads, or Search Engine Marketing (SEM). 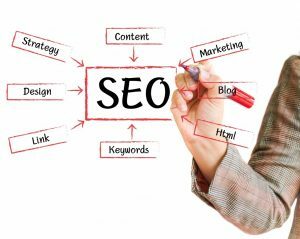 Listed are a few quick, but IMPORTANT, things to know when engaging in SEO for a website. Offer true substance to your visitors that is not easily found on any other generic website. Engaging your visitors will keep them from clicking around on your page for only thirty seconds and leaving, which is a key determining factor in your rankings. This is also known as “stickiness,” or the time someone spends on a website. There are numerous tools that will tell you what keywords people search for in relation to one another. Google Adwords allows you to enter a search term, which then gives you a list of keywords that are correspondent to your original keyword(s). For example, people searching for “vacation” might also search under “travel” or “flights.” Other free tools include Google Trends and Windtracker Keyword Suggestion Tool. Constantly adding material that is relevant to your industry will also give a boost in your search rankings. If a popular search term is “trending” on Google and you include content on that topic, your website will likely show up in the top results for that search. However, after that trending period is over, it’s likely you’ll be lost in the mix again. That is why your goal is to do this often, keeping the emphasis on “fresh.” This can be easily accomplished if your website includes an up to date blog. Content is king. Having more content on your website automatically increases the chance that search engines will become aware of these additions which will increase the visibility of your website. This is really important when it comes to body copy. Body copy refers to real text on the page rather than the visuals of the website, such as imagery and attached copy. This can be intimidating for visual webmasters, however necessary for better SEO. Good luck and keep on optimizing! Image: “SEO,” Sun Vision Technologies, accessed June 25, 2015, http://www.svtecheng.com/SEO.html.